Make sure you bring a clean hand towel and an umbrella in your golf bag when you golf in Thailand. The hand towel is useful to dry the sweat before gripping the club and the umbrella, while made for the rain, will be as important to protect golfers from the sun. The best umbrella is a silver sun type to reflect the sun and heat. A bottle of sunscreen should also be in your golf bag and remember to reapply it, especially to your face, as you will no doubt wipe some away with the towel when you sweat during the round. 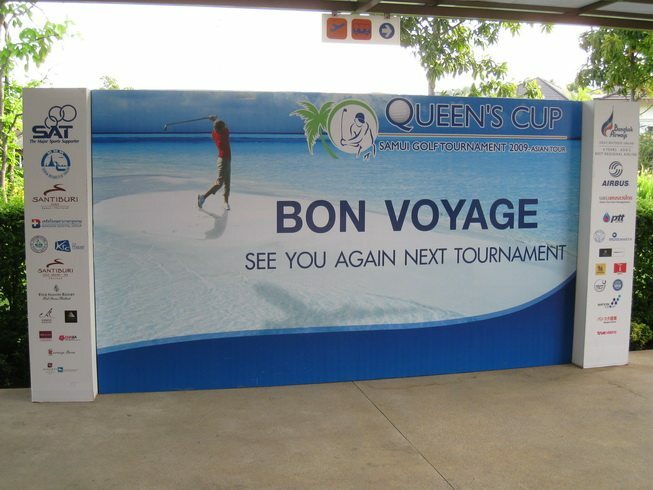 A couple of language tips can be useful on the Thailand golf courses as well. While most Thai caddies are trained to know some English, a little golf Thai goes a long way. For instance, ‘mai’ is wood and ‘lek’, which means small, is used for iron. Learning Thai numbers 3-9 will be helpful so, here they are: 3=sam, 4=sii, 5=haa, 6=hok, 7=jet, 8=bat, 9=kow. Thus, ‘mai sam’ and ‘lek haa’ is is three wood and five iron, reaspectively. Driver and putter are understood, as are sand and pitching wedge. Right is ‘kwa’, left is ‘sai’ and straight is ‘trong’, which will be helpful in putting. Wind is ‘lom’, down wind is ‘tom lom’ and against the wind is ‘tuan lom’. Rain is ‘fon tok’, water hazard is ‘nam’ and OB is OB! On second thoughts many you can just forget these last two! Just go out hit well and have a great time golfing in Thailand.